AGS Noise Control Ltd are an independent, UK based company who specialise in the design, manufacture and installation of all types of noise control materials and equipment. We date from 1977 when as a proprietary company, AG Services, we started manufacturing noise control equipment for other noise control companies. As the company developed and grew we became a limited company, AGS Noise Control Ltd in 2002. Since then we have continued to grow and provide our clients with bespoke designed noise control equipment to suit their exact requirements. AGS Noise Control has their own centrally located manufacturing facility based in Melton Mowbray in the heart of the Midlands where all the products we offer are designed and manufactured. Our design and contract management facilities are also located at our Melton Mowbray base with Autocad CAD design facilities and over 50 years combined experience within the noise control industry enables AGS Noise Control to offer a full turn key project with the minimum of disruption to our clients business. We have our directly employed installation engineers who have fork truck licences, IPAF, PASMA, CSCS etc. We feel committing to direct employment of our engineers gives our clients the benefit of closer control and management of the installation works thus helping to ensure the installation engineers provide the best and most efficient installation as they have a vested interest in ensuring the installation is completed to the highest standards. 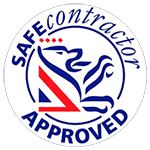 AGS Noise Control Ltd are members of SafeContractor and CHAS. At AGS Noise Control we understand each project is different, with different requirements, aims and objectives. For this reason, each project we undertake starts with a detailed evaluation of requirements, which may include an acoustic survey using our skilled, qualified and experienced acoustic consultants. AGS Noise Control have successfully completed installations throughout the UK, please give our sales team a call on 01664 568728 to discuss your noise control or acoustic requirements or email details of your requirements to sales@agsnoisecontrol.co.uk.